Psychobiology provides a comprehensive, yet accessible introduction to the study of psychobiology and the key concepts, topics and research that are core to understanding the brain and the biological basis of our behaviour. Assuming no prior knowledge of biology, the text emphasises the interaction of psychobiology with other core areas of psychology and disciplines. Through the use of exciting and engaging examples, the role of psychobiology in the real world is explored and emphasisised to allow students to connect theory to practice in this fascinating subject. 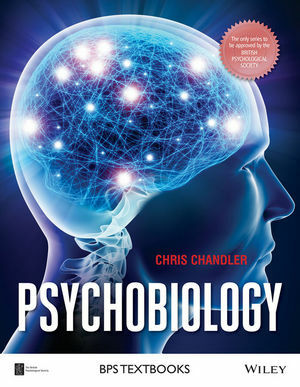 Chris Chandler is currently a Principal Lecturer in biological psychology at London Metropolitan University. He has taught the biological aspects of psychology at all undergraduate levels and to an extremely diverse range of students, giving him ample experience of how to effectively convey complex information to a wide audience. His research background is in dopamine and addiction, as well as an interest in ADHD. Full coverage of all major theories and topics. Engaging discussion of the major research topics and implications of their findings. Key concepts and research are explored in detailin feature boxes throughout the text. Clear summaries, further reading and learning objectives allow students to track their progression throughout the course. Extensive full-colour illustrations to stimulate interest and understanding.